Thanks for the reply hope you are keeping well , would it be possible to email me some pricing and info on these please. Do they need gluing into position ?? I’m not sure what you are trying to do here. In cam and dowel assembly dowels are used as to position the boards so a cam with a dowel either side is easily enough. You don’t need any more dowels. Some people only put one dowel besides the cam. For using mini-fix cams with nesting I’d suggest you use our nest-fix accessory. We have tweaked the design so that it auto blocks you just have to tap it into place and it only leaves a 8mm hole on the under passing panel. The advantages are that it’s flush to the panels and very discrete as when matched to the panel colour you only really see the 8mm hole. The fine adjustment of the centre hole to the 5mm metal dowel means that you don’t need to add extra positioning dowels so once the panels leave the nesting CNC table you only need to edge band and assemble. No messing around with edge drilling etc. I’ve tested nest-fix on a couple of CNC machines and it’s now working well so we will be starting production and will be able to supply quantities in a couple of months. We will be producing a standard part in white plastic that we will be able to colour customise as well as it will be possible to add auto adhesive capping veneer to completely hide the accessory. The accessory works with standard Hafele 12mm cams using 5mm metal dowels, if you want I’ll send you some examples to test with the CNC machining details. 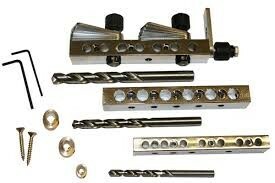 To install nest-fix you’ll need the “T” slot diamond milling bit that we have to have made specially made. We will be selling the tool for around £200. If you’re interested I can order one for you. I would prefer 32mm center drilling as if it works well will buy a multi borer , i have attached 2 cabinets of what i have done so far but getting nicley spaced dowels throughout and keeping holes to a minimum but enough for a good solid construction.